Things I like and don't like, have done or hope to do, and everything in between! 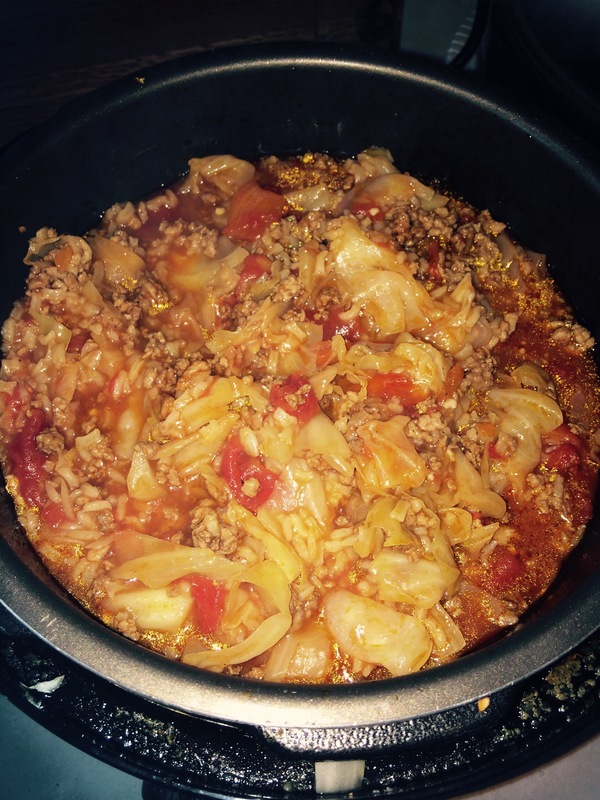 Cabbage Roll Soup – in the pressure cooker! Do you love cabbage rolls, but hate the tedious process of cooking, stuffing and rolling the cabbage leaves without breaking the leaves into 5 pieces!? That is so me! Then to have a complete meal in about 30 minutes is a huge bonus! I gathered all my ingredients and prepped them then put them into the pressure cooker, set it for 20 minutes, left to pick the kids up from school and came home to steaming hot supper! Seriously, how easy is that!? Turn the pressure cooker on to the “brown” method. Add 1 tbsp oil and the onions. Sauté about 3 minutes and add the garlic. Then add in the ground pork and beef; brown. Once browned, drain the fat off the meat and put back into the pressure cooker. Add the rest of the ingredients: rice, chopped cabbage, tomatoes, tomato paste, beef broth, V8/other veggie juice, and seasonings. Stir together to mix well, put the lid on and seal the valve… Set for 20 minutes and walk away. Go fix a drink, take this moment to take a potty break or pick the kids up from school and you’ll come back to deliciousness, but be warned… It’s going to be piping hot!! I have a 6 quart pressure cooker. What sort of release do you do with this? How many minutes? Thanks for sharing your recipe. Looks delicious and I plan on trying it. I wonder if I could pre-cook brown rice and add it instead of uncooked white rice. I have actually started using brown rice since I posted this. You can precook it or add it in and adjust your cook time. I use the same amount of rice whether it be white or brown. I have tweaked this recipe for the brown rice I use and still use the 20 minute cook time. Set it for 20 min….. What setting on the instant pot? My pressure cooker settings are only hi and low. I use high. Thank you for your recipe! This was a hit with the boyfriend and he can be hard to please. I loved it, also. why do I have to precook the brown rice? I have sprouted rice. would that be ok to just put in as is? I’m so glad you both enjoyed it! Thank you for the feedback. Doryne, I don’t precook the rice. I put the uncooked rice and all other ingredients into the pressure cooker after I brown and drain the ground pork. I have never tried sprouted rice, so I’m not sure how that would turn out. I will have to check into it. I just made this for the first time and really liked it. I have a 6qt Instant Pot Duo and I used the Manual high setting for 20 minutes. Since your recipe doesn’t specify the release method or time, I used a 30 minute natural release (following another soup recipe I have). Next time I’ll let it go for only 10-15 minutes. I used brown rice because that was what I had on hand. Since brown rice calls for a 20-minute pressure cook time and this soup also calls for 20 minutes, there was no need to adjust the time. I did, however, soak the rice for about 45 minutes beforehand. Everything turned out great. Thank you for a delicious recipe! Thank you! I’m glad you enjoyed it. If I’m home and not busy I will do a quick release. Tablespoon of both garlic powder and onion powder sounds like a lot. Is that correct? It makes a pressure cooker full of soup, so it’s not overwhelming with spices. Hope you enjoy. I cooked only for 5 minutes with about a 10 min Natural release. Cabbage was perfect,…can’t imagine 18 minutes! No need to cook this soup any longer than 5 minutes. Turned out great. I used 1 lb of pork and 1 lb beef. 6 cloves smashed whole garlic instead of 3 minced. Cooked meat on low Saute’. Chicken bone broth instead of beef. Cooked rice separately and not in soup. 1 serving per bowl before adding soup. Yum! Interesting! I may have to try that next time, but the way I do it it’s always so delicious. This was very good but very spicy.. maybe my type of cayenne pepper was especially hot. Hubby loved it as he loves spicy foods but for me it continued to get hotter as I ate it. Next time I would cut back on the cayenne pepper for sure. Pressure cookers do bring out flavors of spices much more than regular cooking on the stove. Otherwise it was delicious! I had the same issue. I’ll make recipe again, but leave out cayenne. Thanks for the feedback. Spice levels definitely vary from person to person. I am not a spicy food eater, but my husband absolutely loves it and always adds more spice to his plate/bowls. We haven’t found this recipe spicy for us, but I would recommend leaving the cayenne out if you don’t like spicy at all. I just made this and it was delicious! I did it in my 6 qt instant pot with uncooked rice. Set it to ten minutes on soup mode and quick released and it was done perfectly! Yum. Thank you for this delicious recipe! I made it vegan using veg broth and subbing vegan crumbles for the meat. I also eliminated the oil and sautéed the onion and garlic in water. TURNED OUT DELICIOUS! You can use the 15 minute default for white rice, I would think. I have started using brown rice and it tends to need a little more cook time. Can I cut back on the amount of broth to make it more like a casserole than a soup or does it need this much broth for the rice and cabbage to get done? I’m sure you can. It is a “Gumbo” consistency as it is, so cutting the liquid down would thicken it. Let me know how it goes! I’m diabetic so I might leave the rice out of it. This sounds delicious. I am sure it will still taste great without the rice! Looks great. Will it work the same without the rice? Thank you! I haven’t tried it without the rice, but I am sure it would still be great! It will be more liquid-y without the rice, I assume. Thanks for the feedback! I’m glad you enjoyed it. Good luck in your pressure cooker adventures! It’s in my IP now. You didn’t specify natural or quick release. Also, high or low pressure??? I apologize for the delay in replies. I am rarely on this site anymore unfortunately. I do a natural release 🙂 I use the “soup” setting on my pressure cooker. Delicious, inexpensive and easy! I used ground turkey, cut the broth in half and only used half a cup of brown rice (not instant). I was concerned it would be too spicy, so added 1/2 tsp paprika and only used 1/2 tsp of cayenne (I think this was unnecessary, unless cooking for someone very sensitive to heat). This makes a lot of food and I love leftovers, I have a feeling it will be even better tomorrow. Can I use riced cauliflower instead of rice? I apologize for the delay in responses. I’m not on this site much anymore, but yes! We recently did whole 30 for a few months and I think cauliflower rice would work great. Keep in mind it won’t need to cook as long though. I found this recipe easy to make and really enjoy the flavor. I will for sure make this again.